I found an interesting free local Tai Chi class taught by a Taiwanese gentleman in his seventies. I think he’s very good. He teaches the curriculum that begins with 8 forms, and then 16 forms, before proceeding to 24. I’ve already gotten some great corrections from him. It’s a rigorous class. Since I know 24 pretty well, learning 8 and 16 is just a matter of learning the sequences. There’s plenty of good video. 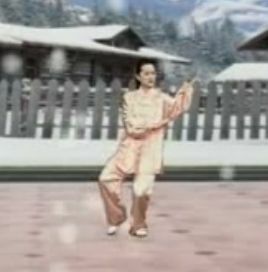 The person demo-ing in the video pictured above is Amin Wu. Notes: Dao Juan Gong is performed in place. Both Lou Xi Au Bu and Ye Ma Fen Zong have a 180-degree turn. Yun Shou is one step left, one step right. Gao Jiamin also demonstrates this form: video. *Dao Juan Gong is more accurately translated as whirling (or overturning) forearms. Repulse Monkeys would be Dao Nian Hou, which is the name used in the old form. That said, a lot of people call this Repulse Monkeys. Avoid confusion; use the Chinese! **AKA Withdraw and Push, an accurate description but not an accurate translation. This entry was posted in Moving Forms by elizabethbuhmann. Bookmark the permalink.